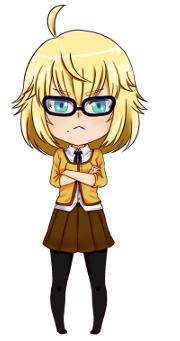 A little while ago, I posted a WIP-preview of a new character sprite for GENBA no Kizuna on our Patreon page. Since Natsu finished coloring it just the other day, I thought I might as well share it publicly now and talk a little bit about this guy today. 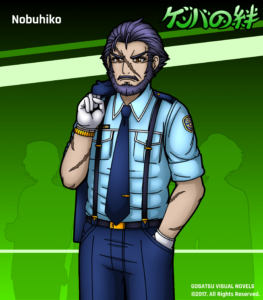 So yeah… Meet yet another member of the police force: the seasoned detective Nobuhiko! As mentioned before a couple of times, three of our four playable main characters (the medical examiner being the only exception) are still rookies. GENBA tells the story of them working on their first real murder case together. Needless to say, you wouldn’t leave something like that purely in the hands of a bunch of newbies. There naturally has to be an experienced detective around to keep an eye on things. And that role is fulfilled by Nobuhiko. Since his exact role will be explained right at the start of the game, I won’t be saying much more than that. I’d rather have you learn the rest while playing through the demo, haha. In regards to his design… I wanted him to be a grizzled detective. Someone older who’d look rather intimidating. Originally, I used Douglas Cartland from Silent Hill 3 as a reference, even giving Nobuhiko a similar trench coat. However, I eventually decided against that idea. It seemed a little too cliché and didn’t make much sense given the fact that the story is set during the height of summer. For a short while, I was considering a suit, but in the end, I decided to go with a proper uniform. I think that suits his personality a lot better. Since his rank is much higher, I wanted to visually reflect that by using gold instead of silver for things like the buttons on his shirt or the buckle of his belt. If you look closely, you can also see that the badge on his chest is sporting three golden bars as opposed to a single silver bar as it is the case with both Keiichi’s and Himatsu’s uniforms. Going by the Japanese police organization, Nobuhiko actually holds Rank 5, which is referred to as 警視 (keishi), the “superintendent”, who can be the chief of a smaller or medium-sized police station. Since Himatsu and Keiichi are both rookies, they carry the lowest rank (巡査 (junsa), a simple police officer).